He replaced David Beckham as Adidas's new poster boy. On the Adidas billboards, spread across London, he was sitting cross-legged; as if cooling his heals after a day's work out, peeping over Londoners, tired and overworked, telling them the secrets of his unfailing energy. 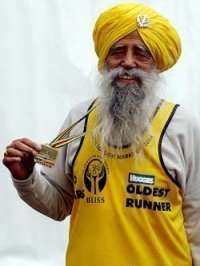 Fauja Singh , Britain 's most popular Sikh is 99 now, the oldest runner in London Marathon. He is threatening to break his own world record of 5.40 hours in the 90 plus age bracket that he set previously. While running Marathon races in London , New York and Toronto , he raised thousands of pounds for various charities promoting Sikh culture around the world. He has also raised money for B.L.I.S.S., a charity dedicated to the care for premature babies. He describes it as the 'oldest running for the youngest. Fauja's jogging skills were developed on an Indian farm in Punjab, and then at the magical age of 81, when he moved to the UK , his love for the sport became more "serio us". 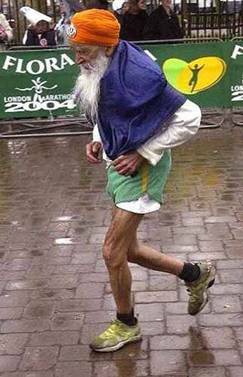 Fauja Singh (born April 1, 1911) is a Sikh marathon runner in his nineties from India who is a world-record holder in his age bracket. His current personal best time for th e London marathon is 6 hours 2 minutes, and his marathon record, for age 90-plus, is 5 hours 40 minutes. 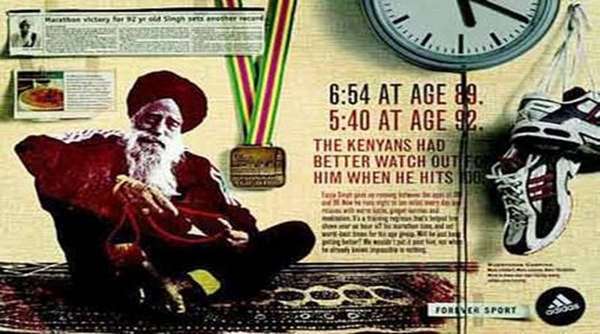 Fauja Singh shot to fame, when aged 89, he completed the gruelling 26.2 mile distance in 6 hours and 54 minutes. This knocked 58 minutes off the previous world best for anyone in the 90 plus age bracket.. The career of this extraordinary Marathon runner is closely supervised by his personal trainer Harminder Singh. He says 'he can still run for a few more years. And perhaps he might be the oldest man to run a Marathon . Fauja Singh came to London in 1992 to live with his son after his wife's death in his village in Jalandhar. He says 'Sitting at home was really killing. Most elderly people in Britain eat a rich diet, don't move about and only travel in cars, and that makes them sick'. He wasn't prepared to go the same way. So he took up jogging initially to beat the boredom of sitting at home. What surprises many is that he supports this eight stone and six feet tall body frame with a very simple vegetarian diet.. 'I am very careful about different foods. My diet is simple phulka, dal, green vegetables, yoghurt and milk. I do not touch parathas, pakoras, rice or any other fried food. I take lots of water and tea with ginger'. Adidas signed him up for its 'Nothing Is Impossible' advertising campaign. He won't reveal how much money the deal involves, but says that a large part of his earnings goes to charity. Fauja Singh has stated,"I won't stop running until I die.. The next target, God willing, is to be the oldest marathon runner ever. Waheguru ji ka Khalsa Sri Waheguru ji ki fateh ... This is a true Sikh.. Chak de fatte ..